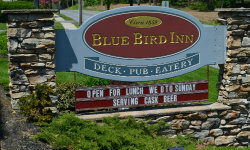 The Blue Bird Inn is set in a building built in 1859 that went through a full (AWESOME!) renovation in 2009. With the renovation and expansion, they managed to maintain the historic charm of the property, while incorporating great design touches to give it a modern yet cozy feel. The bar is inviting and the best part is the multitude of taps offering up great craft beers. They also make some cool infused fruit drinks they whip up from time to time. The bar area has that “loft-like” feel you get when you combine wood and stone with a gorgeous fireplace and classic furniture. If you want to catch a game – any game – they’ve got LOTS of flat screen TVs around the room. In addition to the pub area, there’s a cozy dining room, great for a family dinner or a large group. And outside… there’s the DECK… which gets all caps in an attempt to convey how awesome it is (watch the video!). This this profile has been all about atmosphere and not about food… maybe it’s because I take that for granted? I’ve been eating at the Blue Bird Inn for 4 years and have never had a bad meal… that’s a great track record that not many others can match. It’s not “fancy-fru-fru” food… it’s just GREAT food, well prepared and well presented. The menu gives you plenty of options, LOTS of flavor & spice if you want it… traditional comfort food if you don’t. The burgers are delicious. The Lebanon Valley Rail Trail's Cornwall Trail Head is exactly one mile from the Bluebird Inn, so if you want to either work up an appetite, or work OFF a fantastic meal, there's a lovely tree-lined, peaceful trail right there for you!